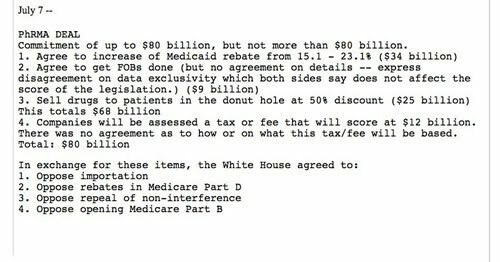 A memo obtained by the Huffington Post (http://www.huffingtonpost.com/) today seems to confirm that the White House and the pharmaceutical lobby have secretly agreed to a wide-ranging deal that both parties were denying over the past week. In a flurry of responses everyone from the drug manufacturer lobbyists to spokespawns for the White House seemed to deprecate the document from Huffington Post reproduced above. But don’t bet this is not the real deal. Obama is now Mr. Compromise, or the chief nibbler, when it comes to standing up for Americans against corporations. He has shown he can talk the talk, while running from the fight. Blue Dog Democrats and New Democrat Coalition members have been stalling healthcare reform for months, and the White House seems on board with this effort, as they support Max Baucus and his so-called compromise efforts with Republicans. There has been no healthcare reform under Republicans for the past eight years, and none under faux democrat Bill Clinton for the preceeding eight. In fact, Medicare and Medicaid have been cut in the hope they would fail and could be privatized so even more executives could collect their tens of millions of dollars in salary and bonuses. Unfortunately, Obama has surrounded himself with many of the same actors from the Democratic Leadership Council who sold out America in the 1990s with deregulation, NAFTA, welfare cuts and outsourcing manufacturing and jobs. A new ad airing in a dozen states is being paid for by a new coalition called Americans for Stable Quality Care. Members of the group are Families USA, the Service Employees International Union, the drug lobby Pharmaceutical Research and Manufacturers of America, the American Medical Association and the Federation of American Hospitals. The ad supports the Obama stance on healthcare. Doctors, hospitals and drug companies are now paying for ads to support Obama’s plan? That proves that he has sold out healthcare reform in favor of insurance changes to bring in 47 million new policy customers, whether they like it or not. Ban books and internet sites – is that why 4,331 Americans died for Iraqi "freedom"? I wish the TV newsmakers [like Keith Olbermann and Rachel Maddow] would reveal the real connections of these “spokespawns” – great word!